The Time of Legends series started with Nagash The Sorceror, where a sinister priest king wanted to find the ultimate power over both life and death. Mike Lee’s sequel novel features the prospect of an army led by an undead priest. Â He comes across the Skaven almost by accident and wants to get his hands on the warpstone they are mining as it will give him more power long term. There are two stories running concurrently, and they can take a bit of following too. One is about Nagash’s rebirth, of him gathering his army for revenge, and taking the crown, while the other is about the Lahmian king and queen who are busy bickering at each other about the standard things, wanting an heir and preventing trouble in the kingdom. Quite annoyed, Queen Neferata is woken from slumber by her handmaiden, Tephret who informs her king has returned and awaits her company with good news, yet when she gets there, she finds something more horrific than she can imagine. Lamashizzar has had his slaves bring back something he can use for his own ends as well as the elixir of immortality he took from Nagash. Neferata is unimpressed by her brother’s actions as she knows he will suffer the consequences of them in the future. He is an impulsive man who is used to getting his own way in an argument and takes no notice of her objections to what he intends to do with it, so it’s a case of it’s his own fault if anything goes wrong. 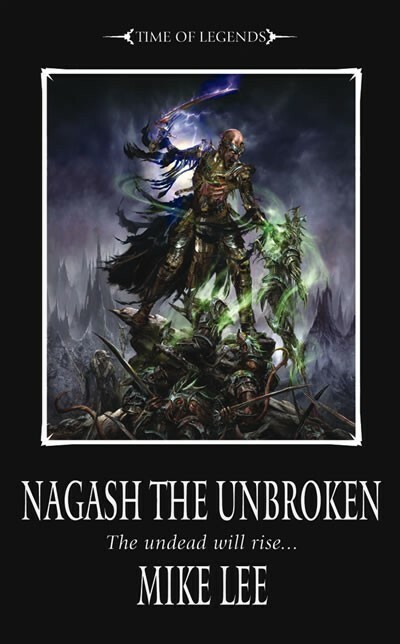 Nagash the Unbroken contains all the ingredients to make a Lahmian style tragedy, with Nagash as the usurper, he wants his brother’s crown as the need to rule runs through his veins. He despises the living, and those he once called friends. Bringing the Skaven into the mix is an added bonus as no one would have ever thought an alliance between Nagash and the Skaven would be possible. The story that runs along this one is just as powerful and concerns the Lahmian royal court and Queen Neferata’s constant feud with her brother, Lamashizzar. They both want what they can’t have; he wants ultimate power, and she wants some kind of peace. End result, no one can agree to anything as they are both stubborn. And, if Nagash gets what he wants, both of them, it seems could find their kingdom invaded by the undead. Mike uses his grasp of arcane ancient knowledge to create the backdrop for this story with its heated nights, stormy desert and subtle dangers. In fact the setting is further enhanced by the richness of the characters. 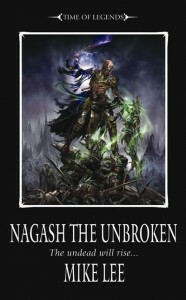 The description of Nagash is one that would force terror into the hearts of anyone who reads this book, one of three ending with Nagash Immortal, and with each as haunting as the next. Nagash cuts a dark figure who has risen from the ground, tormented, angry and out for revenge for those who usurped him and his destiny. He is a man who has nothing but hatred in his heart for the wrongs others have done to him, rather than concentrating on the evil he has done to others. Nagash is a dark and cruel villain, and he makes the story darker by just being there. He is a spectre in the distance while many talk about him and his evil exploits and the downfall of many influential people. He has long since left the trappings of humanity behind, leaving only an immortal soul that feeds off of lives and on discontent, rage and pain. He wants no ones help but sooner or later he has to form a bond with the Skaven in order to come back as the scourge he was many years ago. Mike Lee’s grasp of descriptive fiction and use of powerful dialogue lends a lot of reading pleasure to this novel.